It's been another busy week for Northern Ireland's weekly newspapers, with front pages stories ranging from an axed plan for an artificial beach and benefit "claim chaos". But we start in County Armagh, with a tribute to two young men killed in a road accident near Moy, County Tyrone. 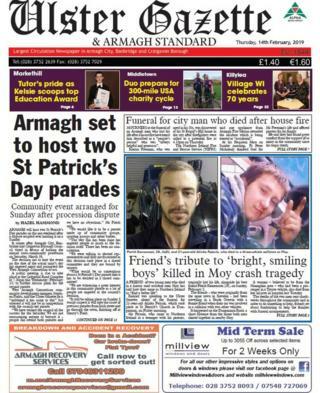 Alinko Fejzula, 21 and Patrick Kemenczei, 26, died in a crash on the Dungannon Road on Sunday, 3 February. The two friends were originally from Slovakia and had shared a home in Moy. A young woman, Brigid McKenna from Emyvale in County Monaghan, who was also involved in the three-car collision, died later in hospital from her injuries. The Ulster Gazette features a tribute from a friend who called the men two "bright, smiling boys". The man, known only as Konrad, told the newspaper that the two young men came to Northern Ireland to "find a better life". He said he would always remember them and how helpful they were. "It's a great loss for all of us," he told the Gazette. Konrad told the paper that fundraising to help cover funeral costs for the two men was at £8,000, a sum "over our expectations" and well on the way to the target of £10,000. 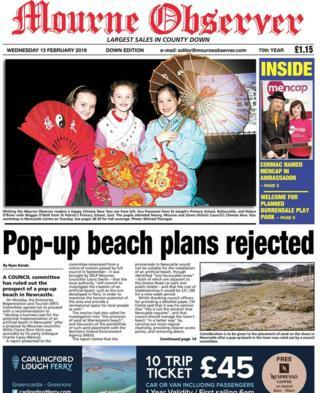 Image caption The original plan proposed an artificial beach "to maximise the tourism potential of the area"
The Mourne Observer leads with the news that a plan for a proposed pop-up beach in Newcastle, County Down has been rejected. On Monday, a Down District Council committee agreed not to proceed with the business plan for an "artificial beach". The original plan was to create a beach "much like the one developed in Paris, in order to maximise the tourism potential of the area and provide recreational space". While thankful for the detailed proposal, Councillor Willie Clarke said that "this is not the solution Newcastle requires". He added that the town should better manage the town's beach by carrying out regular cleaning and removing debris. Meanwhile, the Fermanagh Herald reports on the sentencing of a man from Enniskillen who stole £45,000 from his grandmother. David Elliott, 53 of Derrychara Park had been appointed legal controller of his grandmother's financial affairs, but took thousands of pounds from her account to feed his "gambling addiction". Elliott had a previous record of theft, having stolen £4,000 from a British Legion Poppy Day Appeal, for which he was an organiser. The defence said that Elliott's actions were "mean and unsavoury" and had "driven a massive wedge between the siblings". A two-year prison sentence was handed to Elliott, of which half will be served in custody and the rest on supervised license. 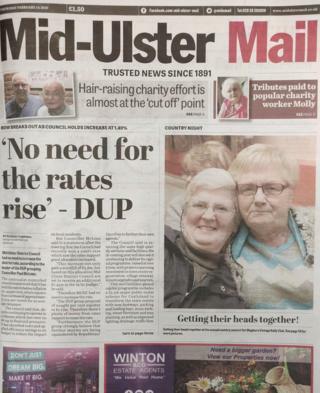 Over in the Mid-Ulster Mail, its front page reports that the DUP has criticised a rates rise. The rise at Mid Ulster District Council would see rates go up by about 50p per month for the average ratepayer. According to the paper, the council said it was operating in "a climate which has seen no let-up in financial pressures" and that it had "absorbed costs and applied efficiency savings to its budget to reduce the impact on local residents". However, DUP Councillor Paul McLean said there was no need for the rise after the council won a court case which saw an increase in its rates support grant. 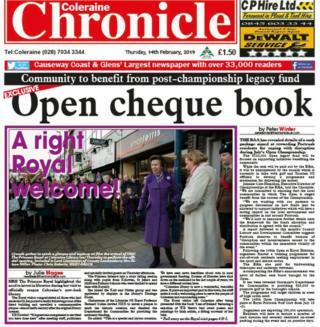 The Coleraine Chronicle carries a tribute to local DJ Chris Hurley, who passed away following a short illness. "Widely described as a 'pioneer' of the dance music scene in Northern Ireland, Chris became synonymous with The Barn at Kelly's in Portrush in the early nineties," it reads. "Starting out playing to a small group of people, Chris's talents ensured that within a short space of time his nights regularly attracted thousands to the north coast venue. "Back in early 1991 when Kelly's Barn was a live band and rock venue, the late James Kelly let a young local lad start a Saturday 'club night' and the rest, as they say, is history." Journalist Damian Mullan writes that Mr Hurley "started with about 20 people on the first night, and within six months was attracting thousands of clubbers from across the north and Donegal, flocking to hear the latest UK and European house music". He adds: "To say he started a legacy would be only fair and Lush would not be here 23 years later as one of the UK's leading venues without Chris's original vision." 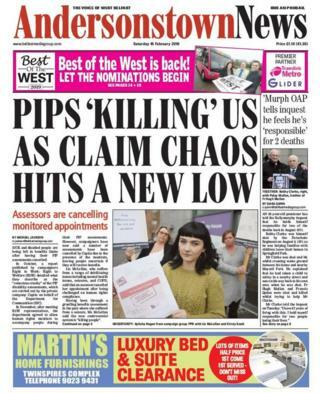 In Belfast, the Andersontown News front page carries the headline "PIPS 'killing' us as claim chaos hits new low". The paper says sick and disabled people are being left in "benefits limbo" after having their Personal Independence Payments (PIP) cancelled. Liz McLellan, who suffers from a range of debilitating illnesses, told the paper that an assessor cancelled her appointment after being challenged on human rights compliance. The Shankill woman said that she had a seizure during a recent face-to-face assessment, at which point the assessor "got up and left the room". Campaigners for Right to Work: Right to Welfare (R2W) have accused private firm Capita, which carries out assessments on behalf of the government, of "deliberately frustrating sick and disabled people by refusing to allow them to record their assessments" unless they use "antiquated tape-recording devices", says the paper. A Capita spokesperson said the "safety and security of our customers and staff is paramount to us in providing our services". It added that while it encouraged its customers being supported by third parties, it would take steps "to protect our staff, and our customers, where we deem it necessary". "This may include suspending or cancelling appointments," it added.